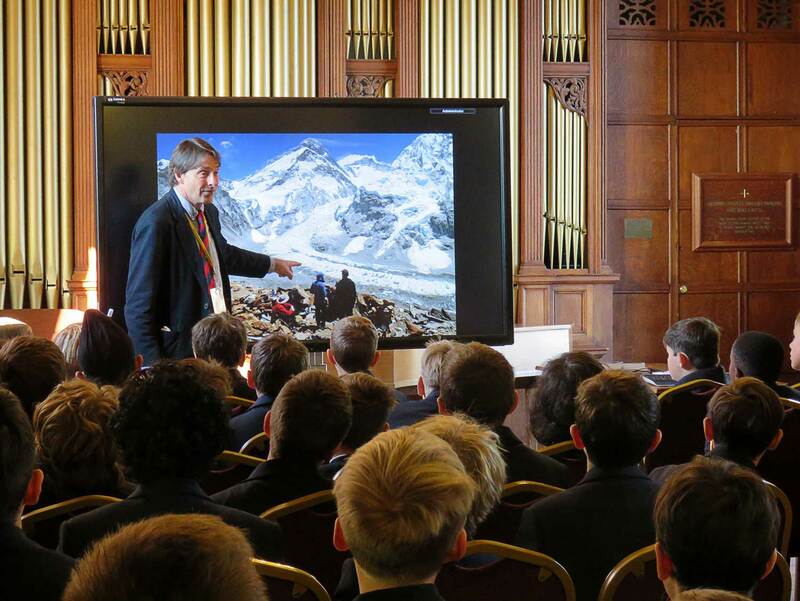 Blue Coat’s Year 7 and 8 boys were excited to attend a presentation by Matt Dickinson – author, cameraman, documentary-maker, and adventurer extraordinaire – who thrilled them with stories of his experiences climbing Mount Everest. Matt described his presentation as the story of his journey, rather than just a “boring old talk”. Matt’s journey began in the library of his school in Hemel Hempstead, when he picked up a book about climbing and became hooked. Matt’s career has taken him all over the world – to Antarctica, South East Asia, all over Africa, the jungles of Borneo, and up both Mount Everest and K2. “It’s been an amazing journey”, he says, “and Everest has been inspiring”. 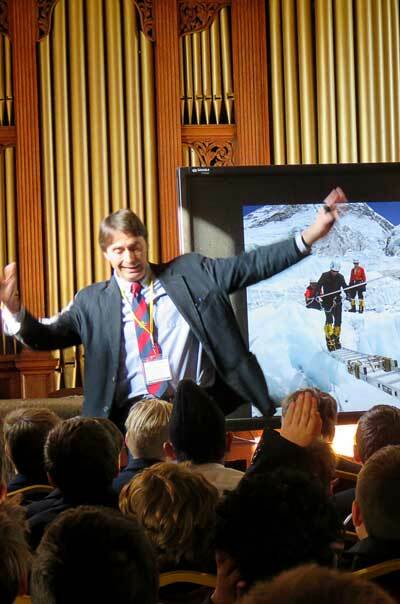 Based on his experiences, Matt has written a series of three books called “The Everest Files”, which tell about the dark side of human behaviour – how people break the rules and become selfishly obsessed with their own glory when trying to conquer Everest… and the heroes that try to overcome this. “My real life experience fired and fueled and inspired every aspect of these books”, Matt says. Matt talked about the tension, fear and risk associated with climbing Everest: how he lost the feeling in two of his fingers due to frostbite damage in -72 degree temperatures; how, for every 100 people who reach the summit of Everest and return alive, four lose their lives (and 29 out of 100 on K2! 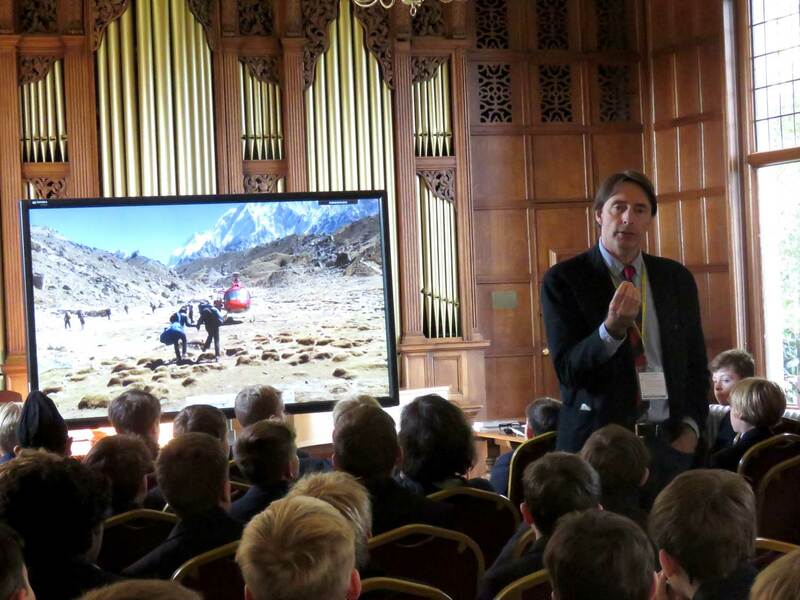 ); the long, hard, three-week journey to the base of Everest, when sherpas carry 80-100kg in supplies on their backs for just £8 a day; the dangers of acute mountain sickness and the enormous cost of mountain rescue ($10,000+! ); 10 weeks without a bath or a shower – or wifi (which elicited a gasp from the crowd! ); the horror of finding the bodies of frozen climbers who have not survived their expeditions; and the danger of sunburn – even inside your nostrils! 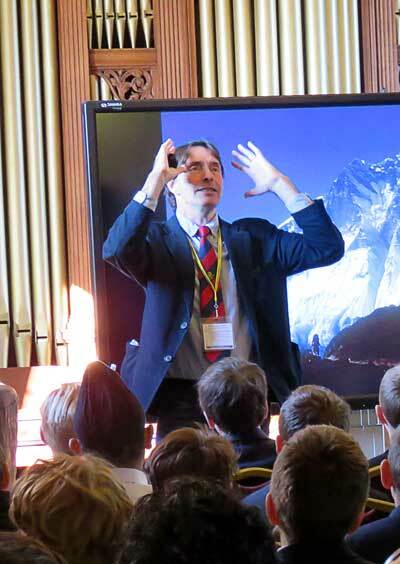 He also told the story of the time he took 250 chocolate bars on an Everest expedition. When he was at a significant altitude, there was an almighty explosion, which everyone thought was an avalanche – but turned out to be the air inside the rice crispies in his 250 Toffee Crisps exploding simultaneously! “Writing has been my channel – my route – to adventure”, Matt says. Matt has written many other books, including ‘The Death Zone: Climbing Everest through the Killer Storm’ (1997), ‘Mortal Chaos’ (2004) and ‘The Adrenaline Series: High, Epic, and Rough Water’ (2007), amongst others. After his talk, Matt signed copies of his book for the many students who had bought them.